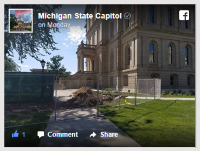 The Michigan State Capitol is a public forum – a place of public expression and assembly. The Capitol and Capitol Square serve as the setting for over 350 events each year. Advocacy days, commemorations, celebrations, exhibits, performances, and protests draw thousands of people to our seat of government. Learn how to schedule an event at the Capitol. Includes hours for the Capitol building and tours. View a full schedule of upcoming events. Schedule of events for the current week. Parking information for buses and personal vehicles. Information about parking, entrance door access, and restrooms. 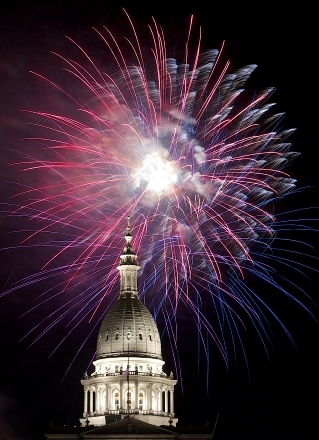 Fireworks over the Capitol’s dome are one of the traditions associated with Lansing’s annual Silver Bells in the City holiday celebration.